The Gateway Galaxy is one of the many galaxies from Super Mario Galaxy for the Wii. It serves as the opening level for the game and after Mario clears its first mission, he won't be able to return here until the Gate is unlocked later on in the game. It has the only purple coin mission in the game that can be played before beating Bowser. This is the first planet that Mario explores in the game. It is where Mario first wakes up after being blasted off Princess Peach's Castle by Kamek in the opening cutscene. Here, he meets two yellow Lumas as well as an apricot Luma who will ask him to search for them. When they are all found, a large light beam goes down from the sky, and the gateway appears, and it is where Mario will meet Rosalina for the first time. The planet itself has three holes in its surface (two of which connect to each other directly through the center of the planet), many small patches of flowers, two connecting Warp Pipes, several rubbery bulbs, two small pools of water, two small cottages, a ring of vertically-positioned rock columns, and a castle-like monument on the top. The planet is also surrounded by a light blue atmosphere. Later in the game, Mario must use the power of the Red Star to collect 100 Purple Coins on this planet, enabling him to use the Red Star onboard the Comet Observatory as well. A planet found in the Deep Dark Galaxy resembles the Starting Planet of the Gateway Galaxy. It can be seen from the Wooden Planet, as well as the Starting Planet. The planet is accessible via a cannon on the latter, and is much smaller than the original one. There are three Goombas here, and a yellow screw that can be unscrewed by spinning it, which will cause the planet to quickly shrink and disappear, at the same time revealing a large ring of coins. After the credits have rolled, when the player has collected 120 Power Stars and defeated Bowser for a second time, the ending sequence that plays occurs here. In the sequence, Rosalina thanks the player and says that she will watch over them from beyond the stars. She then walks into the door of the small blue-roofed cottage on the planet and comes out of the door of the Gate, thereby revealing that the two are connected. It is also revealed that the Comet Observatory is most likely hidden somewhere on the planet (although it cannot be seen when the player actively explores it), as it emerges from behind the planet after Rosalina transforms it into a comet once again and pilots it away. 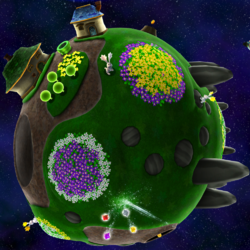 The Starting Planet as seen on a Super Mario Galaxy trading card. After Bowser's attack and blast that sent Mario drifting out into space, our hero wakes up on this planet. He's greeted by a Luma that wants to teach him important planet-hopping tricks. This is where he meets Rosalina, who grants him a critical power - the Star Spin. Mario will stop here again toward the end of his journey to acquire the power of flight from a Red Luma. Mario collecting Star Chips on the Black Hole Planet. This is a planet made of nothing more than dirt, grass and stone. There is a black hole at its center, and it is also under constant bombardment by a meteor shower. There are five yellow Star Chips on this planet that Mario must collect in order to proceed, as well as a rock with a 1-Up Mushroom on top of it. The two Metal Planets in the Gateway Galaxy. These are two metal planets which look very similar to one another. Both planets are brown in color, and have what appears to be metallic green power cables embedded in their surfaces which snake around the planets. In addition, both planets have tall spires that, when spun, will send vibrations across them, stunning all enemies within range. There are many Goombas on both of these planets, as well as several Crystals. Also, on the second of the two is a Grand Goomba, the only one in the entire game. The Flipswitch Area is located inside the second Metal Planet, and is accessed via a Warp Pipe. The Flipswitch Area, located inside the second of the two Metal Planets. When Mario (or Luigi) enters the Warp Pipe on the bottom of the second Metal Planet, he will be taken to an inverted, spherical metal chamber with many Goombas and Flipswitch Panels inside. To shut down the machine and save the first of seven Grand Stars in the game, Mario (or Luigi) must step on every Flipswitch Panel found on the inside of the planet to change all of them from yellow to blue, while simultaneously avoiding the many Goombas and electric platforms. There are several coins floating in the air above them. This mission's objective is to recover the first Grand Star. This mission's objective is to collect Purple Coins using the Red Star power-up. The Starting Planet can be seen in Rosalina's Ice World in Mario Kart 7. Mario Galaxy, a stage in Super Smash Bros. for Wii U and Super Smash Bros. Ultimate, is based on the Starting Planet. Additionally, a small part of the planet that includes the blue-roofed house is depicted on the southern side of the Rosalina Board in Mario Party 10. Hebunzudoa gyarakushī Heaven's Door Galaxy. The phrase ヘブンズドア "Heaven's Door" is sometimes written as "天の扉", but still read as ヘブンズドア. This is one of the two galaxies that have a purple coin mission without a Prankster Comet, the other one being the Grand Finale Galaxy. The Gateway Galaxy contains the only Grand Star not obtained by fighting a boss. This is the only galaxy in the game where Flipswitch Panels have circles in the middle instead of a "?" or "!" and must be turned off rather than on. It is also the only galaxy in which Flipswitch Panels give a Grand Star instead of a normal Power Star. In the background (like Bowser's Star Reactor later on in the game), there are inaccessible Airships. It is revealed by using a flight hack that the Airships are solid, but have no gravity. However, the camera is very glitchy when Mario or Luigi stands on them. This page was last edited on March 4, 2019, at 14:11.